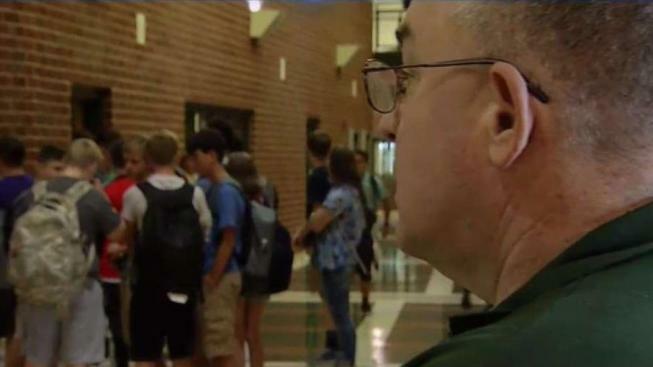 Students in Fauquier County, Virginia, may have noticed some extra faces in the hallways when they went back to school on Wednesday. County officials have hired 12 new school security officers to beef up security at elementary, middle and high schools. Franz Mahler started his new position at Kettle Run High School near Warrenton on Wednesday. “When I got dressed today, I was like: 'I’m starting my new career,'” Mahler told News4. Mahler said he agreed to the position as a school security officer a day after retiring from the Virginia State Police. He was a trooper for 29 years. “A lot of times in my previous job we’re reactive. In this job, I can be proactive,” Mahler said. The county plans for all of the guards to be armed by mid-September. “Every one of our schools will have at least an armed school security officer within their building,” Fauquier County Public Schools Superintendent Dr. David Jeck said. Jeck said the SSOs will often work alongside a sheriff's deputy school resource officer. “Now we know that if [our school resource officer] can’t be somewhere in case of an emergency that we have someone else that’s going to get to us and help us out,” Kettle Run student Harper Crater said. Fauquier County is still hiring and looking for candidates with a law enforcement background and who can connect with young people. “Our school resource officers up until now, have built very good relationships with students. We expect and anticipate that the SSOs will do the same thing,” Jeck said.